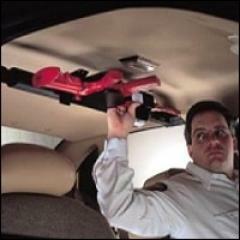 Pro-Gard Pro-Clamp Overhead Vehicle Gun Rack FREE SHIPPING! This is Pro-Gard's exclusive, revolutionary roof mount gun rack system. Pro-Clamp puts the weapon right where the officer needs it. It is engineered to handle a variety of weapons. Easy, 5-minute, clamp-on installation Adjustible installation for each officer's comfort and optimum accessibility. The weapon locks into the gun rack electronically, but there is a handcuff key override. The key cylinder by itself can be removed and replaced at a later time if you decide to change from a handcuff key to a vending or straight key. ©2002-2019 CopsPlus.com: Pro-Gard Pro-Clamp Overhead Vehicle Gun Rack FREE SHIPPING!